Ready to cross skydiving off your bucket list? Experience the incredible thrill of skydiving safely attached to a highly experienced instructor. 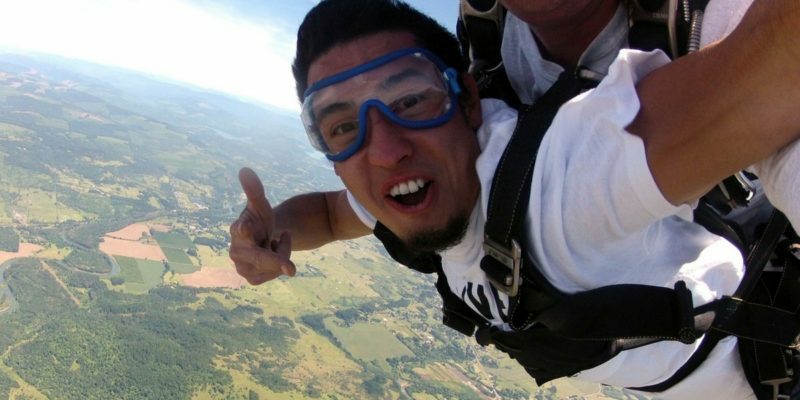 View Eugene Skydivers full list of skydiving prices and discounted rates for groups! 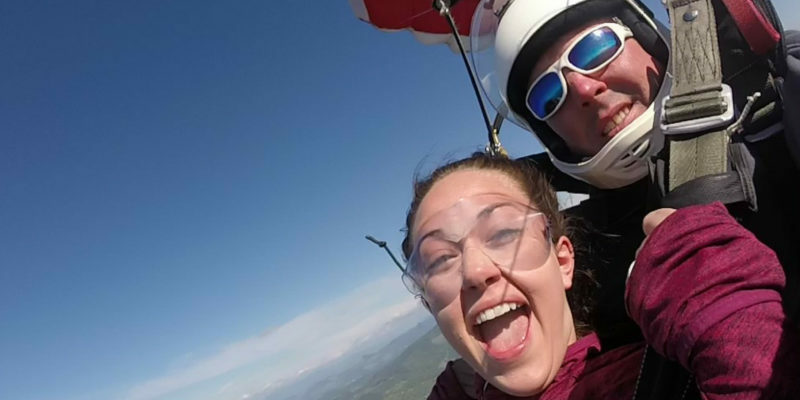 We'd bet you're a little curious about jumping out of a plane! View our FAQs for answers to the most common first-time skydiving questions! Western Oregon’s place to come skydive! Whether you’re here to make a single jump for adventure, or want to learn to skydive for a lifetime of fun, we have a program that will suit you. Welcome to Eugene Skydivers. Willamette Valley’s full-service skydiving facility. Eugene Skydivers has been skydiving at the Creswell airport since 1992. Since then 1000s of skydivers have made their way through the doors here in Creswell to make their first skydive. We specialize in first jump training and will take the time to answer your questions and go over your concerns prior to you making your first jump with us. The instructors that work with us have 1000s of skydives to their credit and understand that this is most likely your first jump. Making each skydive a personal experience is what we believe we do best here at Eugene Skydivers. First time jumpers have questions regarding the specific details of the skydive. From the moment you check in, to the gear up, to the exit from the aircraft and the subsequent parachute landing, our crew work will be there with you to experience and explain this to you. However, be forewarned, best as we try no words can describe the incredible sensation of skydiving from an aircraft almost 2 miles above the earth behind the incredible backdrop of the Willamette Valley in Oregon. From the sky, you can see the Cascade Volcanic Range to include the 3 Sisters, Mount Jefferson, Mount Bachelor, and Mount Hood to the East. To the West, you can see the coastal mountains that reach out to the Pacific Ocean. It is truly a spectacular view to behold. This is something you truly have to experience for yourself. We recognize and support the safety recommendations provided by the United States Parachute Association. USPA is the organization that has established the safety recommendations for the skydiving industry throughout the United States and works closely with the FAA to promote safe skydiving. If you choose to jump with us, we hope you will find comfort in knowing that our instructors are fully licensed and certified by USPA and have thousands of skydives. The instructors that work with us have traveled the world in the pursuit of the skydiving dream and will take the time to share this dream with you. Why not make your first jump with us? We look forward to skydiving with you soon. The staff were very welcoming and enthusiastic such that it felt completely normal to jump from a plane at 10k ft for the first time ever. My friends and I had an incredible experience! Do it!